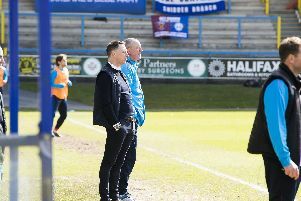 FC Halifax Town remain just one point off second place after Kidderminster suffered a surprise 1-0 dewfeat at relegation-threatened Stalybridge. Danny Pilkington’s 62nd minute goal sealed the win for Stalybridge, who have now beaten all of the division’s top three at home this season. Halifax are seven points off leaders Fylde with four games remaining, with the two set to clash at The Shay on Good Friday before Town visit Harrogate on Easter Monday. That game is all-ticket and fans cannot pay on the day. Tickets are available on the Halifax website until Thursday at 5pm and at the club on Thursday between 10am and 5pm and on Friday between 1.45pm and 3pm. Meanwhile, Darlington look set to miss out on a play-off place due to a lack of covered seats at their ground. The Quakers are currently fifth in the table, and played their first game at Blackwell Meadows against Halifax on Boxing Day. But to qualify for promotion to the National League and to participate in the North and South divisional play-offs, clubs must have at least 500 seats under cover, whereas Darlington’s ground only has around 280 seats under cover.